The New Year brings fresh challenges and opportunities;I will be doing the best I can to meet the former and take advantage of the latter. I hope your New Year will be filled with happiness and love, however you may celebrate this time. Christmas day approaches and the New Year beckons. In the next couple of months I’ll be making a few changes to my site, though I’m still considering what I’ll be adding/removing or revising. 2018 has not seen the progress I’d hoped for, but that’s not a valid reason not to persevere. I am intending to do some rewriting over the Christmas holidays (although my family will be here). Gracious, it’s less than five weeks until Christmas and I’m not as far ahead as I expected by now. House renovation has been going on around me this year, and then combined with the ill-health of family and a colleague, my work in progress time has been restricted. Sadly I’ll be unlikely to meet my June 2019 deadline, unless I can make swifter progress on my current second draft. Although I wasn’t writing I was creating the missing scenes in my imagination so they could be ready for building into the second draft. I’m now on chapter eight writing in the first of these additional scenes. I’m sure every writer has repetitive words or actions that they give their characters without realising it, and unfortunately I’ve noticed my heroine, Sarah, has a tendency to lean against walls to restore her composure after an emotional scene with the hero, Hugh. That will need dealing with in the next draft! There’s an additional sub-plot evolving that I missed in draft one and it will create additional conflict. Having time to think about existing scenes and characters and how these new scenes can bring another layer to the story has been beneficial; so that time has not been wasted. For now, moving forward (even slowly) is essential. Now it’s not the original version from 1951, but a 1981 edition with revisions. I also have this paperback version of it that’s smaller, but I prefer the hardback for the clearness of the illustrations – it may just be the font size and amount of ink used when the book was printed. I always find the material at the back of this book interesting and helpful. There’s a comprehensive Source of the Illustrations, chapter by chapter. The Bibliography gives both the primary and secondary sources. I particularly like the Glossary of Materials. Muslin had different types – something I didn’t appreciate, and couldn’t describe the differences without a little information. The book covers underclothes from the Medieval period up to 1940-1950. There’s even a Appendix of Clothes Rationing for May 1942, giving the number of coupons needed for various items of underclothes, both male and female. If you disregard C.W Cunnington’s earlier books with his apparent theories on women, fashion and sexuality, those books written with his wife Phillis are a good starting point for historical fashion. When I began writing, it was their books on English Women’s Clothing in the 18th Century and the 19th century version that were both the first costume reference books I studied. Phillis Cunnington: born 1887 and died 1974. * The History of Underclothes by C. Willett & Phillis Cunnington, with revisions by A. D. and Valerie Mansfield. Faber and Faber, 1981. While I’ve been absent and unable to make progress due to work on the wiring and plumbing in my home, I’ve been storing the disruption and emotions to share with the hero of my work in progress, Hugh. Hugh has a platoon of workmen updating his manor, but trouble-free is not the plan. He could find alternate lodgings but having been absent for so long it wouldn’t be desirable in the circumstances he faces. The time away from the manuscript has also allowed me to develop the options for the gaps left in the first draft- that must be resolved in the second. Also the antagonists have revealed their motives and produced a few surprises. The months have gone by and I’ve not been able to do as much as I’d wanted. The disruptions will be ongoing for a few months yet while (essential) major work starts on my home in the New Year. Been a busy year so far, and I’m now in the middle of sorting and packing boxes to go into storage, for work to be done on the house. This does mean a large amount of books are going into boxes; do I really have that many historical romance paperbacks? There are a few on my Kindle too, so I have been working my way through my to be read list when I need a relaxing read at the end of the day. 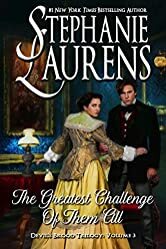 Stephanie Laurens is on my favourite authors list, but I’d put off buying her latest Devil’s Brood trilogy until all three books were available. These are connecting stories concerning the two sons and daughter of ‘Devil’ Cynster Duke of St Ives and his Duchess, Honoria. Years have passed and their children are now grown up and living in early Victorian times. While you can read each book as a stand-alone story there is an ongoing plot involving gunpowder and more that link the books together. Each book immediately follows on from the end of the previous story, so the events take place over a short time span. Personally, book 4 was my least favourite. Of course the ongoing plot needs to be set up and the associated characters, I don’t think Sebastian (the Marquess) appealed to me as much as the other heroes. 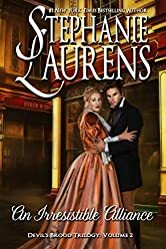 For me Sebastian was overshadowed by the enigmatic Drake Varisey, and the story didn’t really keep my interest until the first major incident, and the developing relationship between Sebastian and Antonia Rawlings, an Earl’s daughter. The map of the grounds of Pressington Hall (where the story takes place) between chapters 3 & 4 surprised me. Likely because of being used to seeing this type of extra toward the front of a paperback. Book 5 moves on to Michael. He has second son syndrome, no pre-determined role to fill, bored and eager to help when Drake Varisey needs assistance. This is a just one more chapter book. I didn’t want to put it down and ended up reading to the end at 1.30 am. Cleo Hendon works in her parents shipping office managing everything, but wanting some excitement in her life; and along comes Michael Cynster seeking information. Cleo is intelligent, daring and not afraid to take the lead and guaranteed to upset any Cynster male. There are lots of twists and turns and misdirection as the gunpowder search continues; as the pace builds toward the conclusion of Michael and Cleo’s adventures. By the end I wanted to start the next book as soon as I could. Of the 3 books, book 6 The Greatest Challenge of Them All was my favourite. Drake (the Marquess of Winchelsea, and heir to the Duke of Wolverstone- from the Bastion Club series) is in charge of defending Queen and country from those intent on causing harm. When he refers to Lady Louisa Cynster by the name given to her by the ton, ‘Lady Wild’, you can sense his dread, and it’s clear that sparks are bound to fly between two such strong-willed and devious characters. That gunpowder has moved again, and every time they seem close to getting answers another barrier springs up to stop them as they race toward the answer to the ongoing mystery. The developing relationship between Drake and Louisa is in some ways complex, but in others simple. 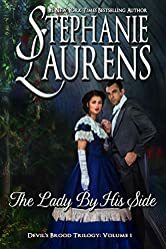 He’s the one in charge and she refuses to be relegated to a troublesome assistant, but they each have depths that you know would take their lifetime to discover. Yes, this was another just one more chapter book, and was a further late night. Each book has an author’s note so you can discover more about the background elements of the story and it is interesting. I’m glad I didn’t give up at the end of book 4. The running gunpowder plot was intriguing enough to make me want to know what would happen next, so I was willing to give book 5 a chance, and it was worth it. I have had a few busy months, but I did manage a much-needed long weekend break in Bath last month, with the main intention of visiting the Fashion Museum. You’ll find a couple of posts over on Carol’s blog about the visits to the Bath Postal Museum and the Museum of Bath Architecture. Both these small museums don’t get the visitor numbers that the better known locations do, but are well worth taking a little time out to see them if you’re in Bath. The Fashion Museum is currently exhibiting the History of Fashion in 100 Objects (until 1st January 2019), along with the recently opened Lace in Fashion. And shoes do feature in my image selection. As lighting is low and items are behind glass to control the temperature to protect the fabrics from deteriorating, I have needed to add light to my images, and you may notice the occasional reflection. I wanted to limit how much adjustment I needed to make, but the ones reflecting the red chairs will take some work. I really didn’t think it was polite to move them just for one photo, so you won’t be seeing that one! My absolute favourite dress was this striped silk Robe à l’anglaise from the 1770’s. Actually I have to admit to favouring the dresses of the 1770’s. They must have looked amazing when they were first worn; the wearer making their way around a ballroom with the candlelight reflecting off mirrors and windows bringing the colour to life. The early costumes displayed a more practical element, less glamour than those late 18th century gowns. They also show how styles could change over a decade, with open and closed robe dresses revealing, then concealing a warm petticoat. There were a few shoes within the costume areas, but further on a couple of display cabinets held a variety of shoes and boots. There were a few delightful items of menswear included, waistcoats, jackets, suits, and an early pair of trousers from the 1820’s. Accessories were not forgotten. There was a display of Bone, Coral, Ivory and Turtle items, that ranged from fans to hair combs and other pieces. It was highlighting the less pleasant aspect of trade in species from around the world during the 18th and 19th century. So that’s just a few items. The exhibition is worth visiting, as whatever decade or century you’re interested in, you’ll find something to admire and be fascinated by. Carol will be putting a few images from the exhibition on her next blog post too. So do take the time to visit.